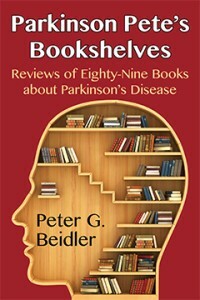 Parkinson Pete’s Bookshelves: Reviews of Eighty-Nine Books about Parkinson’s Disease ($15.95, 260 pp., 6×9 Trade Paperback ISBN: 978-1-60381-746-2), is an invaluable reference work for anyone who lives with the disease or knows someone living with the disease. The book is divided into three sections: 30 works of nonfiction by doctors and others who do not have the disease, 36 works of nonfiction by doctors and others with the disease, and 23 novels featuring characters with the disease. Peter G. Beidler, aka “Parkinson Pete,” is the Lucy G. Moses Distinguished Professor of English, Emeritus, at Lehigh University in Bethlehem, Pennsylvania. He has published widely on pedagogy and on authors as diverse as Geoffrey Chaucer, Henry James, Mark Twain, J. D. Salinger, and Louise Erdrich. Parkinson Pete’s Bookshelves is his sixth book with Coffeetown Press. He was diagnosed with Parkinson’s in 2006. He lives in Seattle, WA. Parkinson’s disease has struck more than a million people in the United States, and many more worldwide. Although it is an incurable, progressive, and ultimately debilitating neurological disease, Parkinson’s can be managed with certain medicines, treated with certain surgeries, and slowed down with regular exercise and nutritional regimens. In the past two decades, many conflicting and confusing books about Parkinson’s disease have appeared. Some were written by doctors who have been trained to study and treat the disease. Some were written by men and women with the disease who wanted to share with others what they have learned. Still others are novels about fictional characters with Parkinson’s. How are doctors, patients, families, friends, and reference librarians to know which book or books will best serve the particular needs of readers? Parkinson Pete spent several years collecting, reading, and writing reviews of eighty-nine books about the disease. His no-nonsense reviews are an indispensable guide for people who want to know what books will most help them understand Parkinson’s disease, the people who have it, and the people who treat it. At the beginning I found myself wanting to read especially the books on Shelf A. I wanted facts, information about my disease and its history, about the medicines I might take, the surgeries I might be eligible for, the long-term prognosis, the likelihood of a cure. As I read the books on Shelf A, however, I sometimes found myself feeling like I was all body, no spirit. I sometimes felt that I was being talked down to by people who sometimes seemed to be more interested in my disease than in me. After that, I found myself drawn to the books on Shelf B, books written by people with my disease. I wanted to hear from people like me who knew what it felt like to have Parkinson’s, who had experienced first-hand the confusion and the terror that comes with the diagnosis. I wanted not so much scientific facts by supposedly dispassionate doctors and other professionals, but information and advice from other people who had walked in my trembling footsteps and stumbling shoes. And then I found myself picking up the novels on Shelf C. These were books that told a story, often an exciting story, about people who had Parkinson’s. I found that the Shelf C books were particularly useful in portraying two kinds of nasty reality that the writers of both Shelf A and Shelf B tended to shy away from. One of these was the stresses that Parkinson’s visits on families of men and women with Parkinson’s. The other was how people in the later stages of the disease live and how they die.